The cross laminated timber market report by Persistence Market Research covers information about market trends, volume (cubic metre) and value (US$ Mn) projections, market dynamics and recent developments in the global cross laminated timber market for the study period 2018 to 2026. Cross laminated timber is primarily utilized in the construction of commercial, single and multifamily housing and high rise buildings. Attributing to its high stiffness and in-plane and out-of-plane bearing capacity, it is utilized in the form of floor or wall panels. Its favorable environmental, aesthetic and energy properties further enhance the quality of the construction. 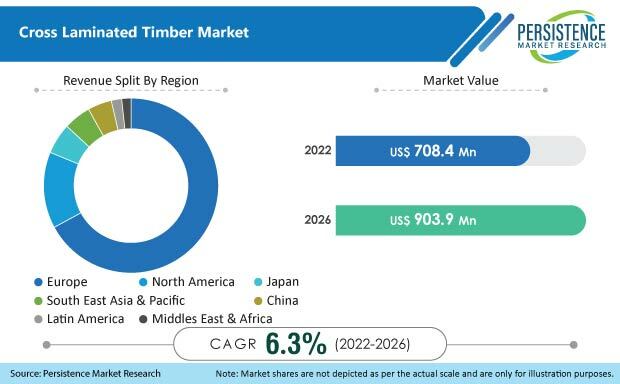 The global cross laminated timber market is estimated to have been valued at US$ 508.4 Mn by 2017 end and is expected to reach US$ 903.9 Mn by the end of 2026 while expanding at a CAGR of 6.6% over the forecast period. The global cross laminated timber market is anticipated to represent an incremental opportunity of US$ 360.2 Mn between 2018 and 2026. Timber construction technology has undergone a substantial change in the past few decades with the development of new materials and understanding of timber properties. One of the most representative products of re-evaluation of timber construction is cross laminated timber. Building manufacturers and contractors are employing materials with lower environmental impact and eyeing wood, specifically cross laminated timber, a timber that has a smaller environmental footprint as compared to that of concrete and steel. Attributing to these reasons, the demand for cross laminated timber is expected to rise in near future. Prominent manufacturers involved in the production of cross laminated timber are continuously focusing on investments in their production facilities to transform themselves into prominent suppliers of low environmental impact timber solutions to replace concrete and steel in construction projects across the globe. For instance, in September 2017, Stora Enso Oyj announced an investment of US$ 51.0 Mn into the development of its production line, thereby making the company one of the prominent suppliers of cross laminated timber across the globe. Among all end-use segments analyzed in this global cross laminated timber market study, the residential segment is expected to register about 1.6X growth in terms of value. In the recent past, utilization of cross laminated timber in the construction of residential and single-family housing has grown at a significant pace. In terms of incremental opportunity, commercial & institutional and industrial segments, together, are expected to account for more than 2/5th of the overall incremental opportunity created during the forecast years in the global cross laminated timber market. The introduction of environmental regulations pertaining to the utilization of timber-based construction materials in buildings is expected to push the demand for cross laminated timber in Europe. Moreover, cross laminated timber-based buildings have a low carbon footprint as compared to alternative materials in the market. The Middle East & Africa region is expected to register 1.8X growth in the cross laminated timber market. Various countries, including Mexico and Brazil, in the region are expected to exhibit significant growth during the forecast period in the cross laminated timer market, owing to the increasing demand from residential as well as commercial & institutional sectors. All the other regions are expected to exhibit relatively moderate growth over the forecast period in the global cross laminated timber market. Some of the participants included in this report involved in the global cross laminated timber market are Stora Enso Oyj, Binderholz GmbH, Mayr-Melnholf Holz Holding AG, KLH Massivholz GmbH, HASSLACHER Holding GmbH, Structurlam Mass Timber Corporation, Eugen Decker Holzindustrie KG, Ed. Zublin AG, Schilliger Holz AG, W.u.J. Derix GmbH & Co. and weinberger-holz GmbH. The global cross laminated timber market is partly fragmented with the top 5 players holding a significant part of the overall market. Globally, the top 5 players in the global cross laminated timber market collectively hold more than half of the overall market share. In the recent past, the cross laminated timber market has witnessed significant developments from a competition perspective. The introduction of production plants is found to be one of the key strategies opted by key players to sustain and expand in the global cross laminated timber market. How has the cross laminated timber market evolved in the past four years? How is the cross laminated timber market expected to take shape in terms of volume and value during the study period? What are the prevailing market dynamics in the cross laminated timber market? What are the competition developments and trends in the cross laminated timber market? What are some of the underlying macro-economic and industry factors impacting the growth of the cross laminated timber market? How is the competition structured at present and how has it evolved in the cross laminated timber market over the past few years?